« An Unforeseen Effect of Global Warming? Someone Out There Is a Flat-Earther, But Who Is It? Since Stephen Williamson posted his criticism of NGDP-targeting last week, a series of responses (here and here) and counter-responses have taken the discussion beyond the mere discussion of a criterion or rule for monetary policy, transforming it into a deep discussion of nothing less than alternative world-views. The catalyst for this shift in the nature of the discussion was Williamson’s use in his first post of the Hodrick-Prescott filter to detrend quarterly GDP data since 1947. Scott Sumner noted in his initial reply to Williamson that the Hodrick-Prescott filter necessarily interprets a downturn occurring at the end of the time series as a shift in, rather than a deviation from, the trend, thereby imposing a particular view of the nature of the recent downturn that might or might not be correct. In my comment on the initial Williamson-Sumner exchange, I noted Scott’s point, and added that an eminent time-series econometrician, Andrew Harvey, had warned about the possibility of spurious results from application of the HP filter, though he did not reject its use as necessarily inappropriate. Brad Delong and Tim Duy picked up on my warnings about the potential for HP filtering to result in spurious results with what seemed like blanket condemnations of the HP filter. This is when Paul Krugman joined the fray, warning that the HP filter could be used to show that the Great Depression reflected not a huge departure from the economy’s potential output and employment levels, but a shift in those levels. 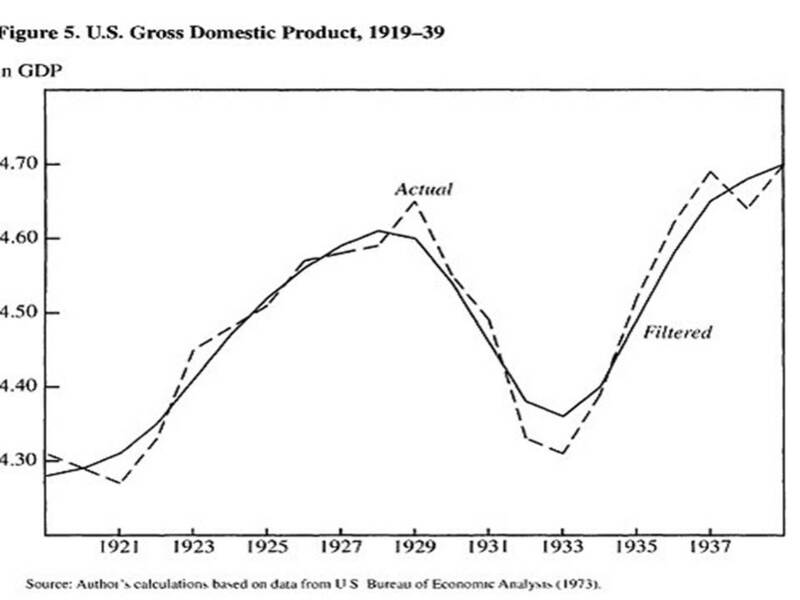 Yep: the HP filter “decided” that the US economy was back at potential by 1935. Why? Because it automatically interpreted the Great Depression as a sustained decline in potential, because by assumption the filter incorporated such slumps into its estimate of the economy’s potential. Strange to say, however, it turned out that there was in fact a huge amount of excess capacity in America, needing only an increase in demand to be put back into operation. It seems totally obvious to me that people who are now using HP filters to argue that we’re already at full employment are making exactly the same mistake. They have in effect, without realizing it, assumed their answer — using a statistical technique that only works if prolonged slumps below potential GDP can’t happen. As always, statistical techniques are only as good as the economic assumptions behind them. And in this case the assumptions are just wrong. This attack by Krugman predictably elicited a response from Williamson. The response might have simply noted that applying the HP filter requires the investigator to make assumptions about the frequency of changes in the underlying trend, and that such assumptions ought in some sense to be reasonable. The particular assumption underlying Krugman’s figure was not necessarily reasonable — it didn’t smooth enough — and probably would not be accepted as such by those who like to use the HP filter. Williamson made this point, but he went beyond it, discussing how the HP filter is used within the larger theoretical paradigm known as modern real-business-cycle theory. I won’t attempt to summarize Williamson’s discussion, but this is the point that I would like to focus on. Real-business cycle theory posits that observed fluctuations in economic time series, like real GDP and employment, can be understood as responses by economic agents to underlying changes in real underlying economic conditions, e.g., changes in labor productivity. Persistent changes in GDP must therefore reflect changes in the underlying real economic conditions, i.e., changes in the trend, while short-term fluctuations around the trend correspond to what we refer to as business cycles. The HP filter smoothes, but does not eliminate, fluctuations in the trend corresponding to persistent changes in the time series. When the time-series show persistent movements, as growth in GDP has shown since the middle of the last decade, even before 2008, real-business-cycle theory assumes that underlying real economic conditions are responsible for a downward change in the underlying trend. There may be transitory changes in the observed time series about the trend, but the trend itself is assumed to have changed. If the trend itself has changed, there is not necessarily any room for policy to make things any better than they are. Given what’s happened to this economy, I think we’re pretty close to maximum employment right now. The “dual mandate” the Fed operates under includes language to the effect that the Fed should try to achieve maximum employment. Lacker says we’re there, and I’m inclined to agree with him. Claimed to have explained the business cycle. The situation described by Williamson and Smith (who, I should note, is not really a fan of real-business-cycle theory) reminds me of the situation at the time of Galileo, when Galileo was trying to explain to people why they should disregard their common-sense notion that the earth is stationary and flat, and that the sun revolves around the earth. In his famous book, The Structure of Scientific Revolutions, Thomas Kuhn called the clash between Galileo and scientific establishment of his time a clash of paradigms and of world views. Kuhn made the controversial claim that, based on the available evidence at the time, the received Ptolomeic paradigm was empirically better supported the than revolutionary Copernican-Galilean paradigm. Nevertheless, the Copernican-Galilean world view fairly quickly won out, producing a paradigm shift even before Newton provided more powerful evidence than Galileo for the heliocentric paradigm. Each paradigm could still interpret evidence apparently in conflict with its predictions by reinterpreting the evidence. Evidence was interpreted not in some purely objective, neutral way – there is no Olympian perspective from which facts can be objectively determined — but from the perspective of the paradigm that either side was trying to uphold. Similarly today we are watching a clash between two competing paradigms of business cycles. The received paradigm of business cycles holds that persistent deviations of observed real GDP growth and employment from long-run stable trends are problematic and call for policy responses to eliminate or reduce those deviations. Real-business-cycle theorists reject that understanding of business cycles. If there are persistent deviations of observed real GDP and employment from their long-run trends, it is the trends that must have changed. This difference in world views has, on occasion, been described, misleadingly in my view, as a conflict between Keynesian economics and common sense, and in a post that I wrote almost a year ago, I cited Galileo to show that our common-sense notions are not always infallible. There is a strong temptation to dismiss real-business-cycle theory simply on the grounds that it seems to fly in the face of our common-sense view that in recessions and depressions, people who would like to work can’t find employment. I think that real-business cycle theory should be dismissed, but to do so will require better reasons than a conflict with our common sense. Remember it was the flat-earthers who were upholding common sense against Galileo. We need more sophisticated arguments than appeals to common sense to dispose of annoying modern real-business-cycle theory. The question is, is what is needed a better reason to reject real business cycles? Or is it, rather, the need for a better positive alternative? I don’t think you’ll disagree that the main alternative to RBCs, New Keynesian models, don’t really avoid the main problem with the RBC approach – they don’t actually explain cycles, but simply postulate an appropriate distribution of “shocks”. This is a great post but you make it sound like RBC is the new, fresh kid on the block, whereas that really isn’t the case. JW, Thanks, I was afraid that I was being unfair to the Ptolomeists, but you can’t make an omelet with breaking eggs, right? I don’t like the New Keynesians either, because they have taken over too much of RBC modeling strategies, and simply tweak the basic RBC model hear and there to derive the desired policy interventions. What is missing is a good explanation of the propagation mechanism by which shocks get magnified into bigger disturbances. Unlearningecon, Thanks. You are right that the tone of the post is more positive about RBC than it should have been. But it was late last night when I finished and I didn’t have the energy or the patience to keep working on it. Sorry. Seemingly stable trends can be averages of very different trends in underlying variables. Disaggregation of income growth, for instance, shows a very different trend from the bottom 90% of the population to the top 10%. The divergence in spending has been much lower, in part because of the build-up in household debt in the 90%. Are you saying that this dynamic should “naturally” persist over time? Overall, Hurst and his co-authors estimate that roughly 40 percent of the increase in nonemployment (those who are unemployed but still looking for jobs, as well as those who have given up and exited the labor force entirely) since 2007 involves manufacturing jobs that were already lost during the earlier part of the decade. But the loss of these jobs was temporarily obscured by the housing boom that allowed low-skilled individuals to find work. Especially given your knowlege of the theory of “free banking,” I wonder what you think. Nobody was a “flat-earther” in Galileo’s time, the ancient Greeks knew full well the earth was round. And my recollection of Kuhn is that the early astronomical data (before, say, telescopes) was often of low quality. When better data was gathered, the heliocentric model (using Kepler’s elliptical rather than Copernicus’ circular orbits) started looking better. Garrett Jones noted in an EconTalk podcast that there was a real empirical phenomena that RBC formed partly in reaction to: labor productivity was lower than usual during recessions. In the most recent recession the lower productivity workers have been let go so the productivity of the remaining workforce actually went up. His conclusion was that there can be multiple types of recessions, and this one is not the RBC type. The pro-cyclicality of labour productivity was explained by Fay/Medoff in ’85 as labour-hoarding by firms, during normal recessions and normal booms. This is consistent with *real* stories of the heterogeneity of labour/sectors type rather than the technological shocks story of Prescott style RBC. Summers used this argument in his article expressing skepticism about RBC (to my mind it was the strongest part of his article). One can argue/show that this pattern will be reversed in recessions that are accompanied by big re-evaluations of wealth and risk, like the current one. I’m a bit surprised that Jones talks about recessions with pro-cyclical labour productivity as RBC recessions – to the extent that they are ‘real’ (or supply side), they seem more consistent with the PSST/ human capital story of Garrett Jones (!) than the technological shock story of Ed Prescott. Great post. Leijonhufvud has argued that *Keynesian* recessions are fundamentally real, in origin and propagation (though they may be nominal in policy action and solution). The difference between this story and the RBC story is that by assuming inter-temporal equilibrium and optimization, RBC is forced to conclude that recessions must be technology/ labour preference shocks. If you give up Walrasian price theory and equilibrum, and instead adopt Marshallian price theory and disequilibrium, there is nothing strange about reconciling *real* recessions with aggregate demand failures. I believe Roman Frydman’s research program on IKE (Imperfect Knowledge Economics) might be a way of reconciling RBC/New Classical insights with more traditional AD insights in a way that should resonate with you, given your UCLA style microeconomics. David, No, I don’t say that. I think that when we talk about an underlying trend we are postulating a purely hypothetical concept that has no observable counterpart in the real world. That is why in business-cycle theory, the theorist can, within wide limits, literally create his own reality, as Prescott et al. have shown. They create a model, calibrate it, simulate it, and eyeball the data generated by the simulation, and if they think it looks close enough to data generated by reputable data collectors, they claim to have explained the business cycle. I wonder if there is any other purportedly scientific discipline in which theories are “tested” in this fashion. About the Hurst et al. study, how does the loss in manufacturing jobs in the period under study compare to previous time periods from say 1985 to 2005? Rick, I am only slightly acquainted with Keen’s work. He had a recent paper criticizing Krugman’s version of Minsky which I glanced at. I liked some things and in and didn’t like other things. I can’t remember too much beyond that, but I am sure that I sympathize with much of his criticism of real-business cycle theory and New Keynesian theory, but I would probably disagree with how he goes about telling his own story. But he seems pretty smart and seems worth a hearing even if what he’s offering isn’t my cup of tea. That’s about all I can say at the moment. Wonks Anonymous, As I mentioned to JW above, I was a bit sloppy in introducing flat-earthism into a discussion of Galileo, but I couldn’t resist the temptation to use the term. I agree that improved data collecting helped the cause of the Copernicans against the Ptolomeists. I think Kuhn’s point was that the shift to Copernicanism preceded the availability of evidence that refuted the Ptolomeians, so that the simple Popperian story in which theory choice is governed by empirical refutation of one theory compared its competitor was not borne out by the historical evidence. Thanks for the reference to the EconTalk podcast. I’ll try to find it. Ritwik, Well, Leijonhufvud taught me intermediate and graduate macro, so I guess I must have picked up a thing or two from him even though my views shifted somewhat as a result of my subsequent exposure to another UCLA luminary Earl Thompson. David Laidler also criticizes RBC on precisely the same grounds. I know of Roman Frydman’s work, and am very impressed by it, but haven’t studied it as closely as I should, but I do think it fits in extremely well with my UCLA way of thinking as you conjecture. However, my view is that RBC/New Classical insights are few. It’s all about formal technique and a sterile view of how economics should be practiced. You think? is this in more recent work? In “Keynesian Economics and the Economics of Keynes” and other writings from that era, he is very insistent that in a true Keynesian framework recessions always begin with an interest rate that is too high. Of course this may not be because of a rise in interest rates — though it may be — but because the expected returns on investment have fallen and the interest rate has not fallen with them. But the monetary element is always essential. The box with “40:22” here contains the RBC/productivity discussion. PSST is not Garett Jones’ theory, I wouldn’t deem it much of a theory at all. It’s something that Arnold Kling promotes, without giving much reason why anyone else should favor it over other explanations, sometimes referencing a “Garett Jones” economy to explain employment trends. The Jones effect of hiring fewer workers because organization capital isn’t needed is perfectly compatible with a standard Aggregate Demand story. My recollection is that both theories had serious inaccuracies (partially concealed by the faulty data they were fitted to), and Copernicus didn’t win out right after presenting a new paradigm. More work had to be done in that vein, most importantly by Kepler. And Copernicus wasn’t motivated by inaccuracy in the Ptolemaic model or even epicycles (his own theory still had them, if fewer in number) but the silly (to modern minds) insistence that everything had to be composed of perfect circles. Ironic, since abandoning the circles was what was necessary for the heliocentric theory to really come into its own. I take my insight from this paper by Leijonhufvud. Essentially, for Leijonhufvud, real does not mean ‘supply side’ as conventionally understood. Real means inter-temporal. He says that while Keynes may be understood from ‘the dark forces of uncertainty and time’ and liquidity preference perspectives, the main claim that makes his theory ‘General’ is that decision to consume less today does not represent or is not expressed as a decision to consume more tomorrow, i.e the market for interest rates does not clear, even when you assume interest rates being determined by the IS curve (loanable funds) rather than the LM curve (liquidity preference). This is not a zero lower bound phenomenon, and this is not necessarily a ‘money market’ phenomenon, though that does add complications. For Leijonhufvud then, Keynes occupies the R/R (real impulse, real propagation) quadrant in his matrix, albeit it’s R/R disequilibrium, with Marshallian price theory. If you have Walrasian price theory, you have assumed away intertemporal disequilibrium through tatonnement, or the Walrasian auctioneer. Hence, the only way you can end up in disequilibrium is the N/N quadrant. Leijonhufvud says that this is the quadrant occupied by Milton Friedman (though Friedman’s price theory was Marshallian), and later goes on to say that the then existing wave of New Keynesian economics (Hall, Taylor, perhaps Mankiw) also occupied this quadrant, though they were purportedly defending Keynes. I see this quadrant as also consistent with monetary disequilibrium/ market monetarist positions – the only way you can get recessions is nominal impulses (monetary policy errors) and nominal propagation (nominal rigidities, money illusion). He sees the R/N (Samuelson-Solow-Modigliani) and N/R (Lucas, before the advent of Prescott/Sargent) quadrants as internally inconsistent and hence open to easy attack. RBC is R/R, but it is R/R equilibrium, so that what should have been Keynes’s rightful place had become Prescott’s! One way to interpret the R/R description of Keynes is to say that contra Nick Rowe, general gluts will arise in any economy that is making inter-temporal trade-offs without the information to make the *right* trade off or the avenues to express the trade-off fully. You don’t need monetary exchange for recessions. This needs a wholesale rejection of Walrasian price theory in favour of Marshallian. Another way to interpret this is to say that Keynes is intellectually a lot closer to Wicksell (a sense that I always get from Leijonhufvud) than presumed. In this sense, New Keynesian theories post Woodford are beginning to claw at the truth, but they are still stuck in the N/N quadrant because they are unwilling to give up inter-temporal equilibrium. One can argue that there are significantly more avenues these days to make/ express inter-temporal trade-offs than in Keynes’s time, so the case for inter-temporal disequilibrium is weaker. The resolution to this (and the reason to move back into the R/R disequilibrium quadrant) can be the imperfect information strand in the microfoundations of macro, with Roman Frydman, following Phelps, being the main macroeconomist who comes to mind. Incidentally, I remember Leijonhufvud writing elsewhere that while Phelps’s natural rate of unemployment hypothesis is at radical odds with Keynes, he (Phelps) deserves credit for being among the few people who recognized the Keynesian insight about labour market disequilibrium – involuntary unemployment – being isomorphic with inter-temporal disequilibrium (market interest rates being out of whack with the natural rate). One may also note that in the 2000s, Mankiw shifted his Keynesian microfoundations project from sticky prices to *sticky information*. Sorry for the long comment, and my apologies if I have misinterpreted anything that these fine gentlemen have written. Ritvik, thanks. Now that I understand what you’re saying, it seems exactly right to me. JW, Leijonhufvud has a simple matrix of impulses and propagations mechanisms. Impulses can be real (change in the marginal efficiency of capital or productivity shock), or nominal (change in the money stock), and propagation mechanisms can be real (market rate doesn’t equal the natural rate) or nominal (wages are sticky). The pure Keynesian case is a real impulse combined with an interest rate that doesn’t fall sufficiently to induce enough investment to generate full employment. You can draw a simple matrix showing the four possible combinations of impulses and propagation mechanisms. For more detail on all this see Ritwik’s excellent comment. Wonks Anonymous, Thanks for your short summary of the history of the Copernican debate, which also shows how important subsidiary hypotheses can be in the empirical testing of theories. Ritwik, Thanks for your very good and pithy summary of Leijonhufvud’s paper, a characteristically insightful assessment of how macroeconomics really lost its way in the 1970s. I think that the intertemporal disequilibrium interpretation can be framed more generally in terms of inconsistent expectations about future prices. Such an inconsistency can be thought of in terms of a failure of the interest to adjust, but, as we have been discussing recently, it can also involve expectations of future wages by workers that are inconsistent with the price expectations of employers. I have enjoyed reading this site in the last few days since I became aware of its existence. While I know you are no fan of Hayek I think his views have two points relevant here. First the common sense view is not right just because it appears to be so. For years before Keynes many uninformed people believed that unemployment and recessions came about from a lack of total demand and could be cured by additional expenditure and credit expansion. In many ways it was a mark of an economist to explain why that apparently obvious point of view was not correct. With Keynes that changed and he gave intellectual respectability to the “obvious” view. That view is then “proved” right by demonstrating a correlation between total demand and total employment and the false conclusion drawn, that the correlation demonstrates that unemployment can be lastingly cured by pushing up total demand. It is variations on this basic methodology (of looking for relationships between aggregates) that enables the protagonists in the first part of your article to come to completely different conclusions, though I don’t doubt that they each believe the evidence supports their own view. Second the fixation with aggregates means that we neglect the underlying structure of prices and production. When we increase total demand that demand will run into some sectors ahead of others and we will distort the entire pattern of the economy. Some assets will come into being that would not otherwise have done so and in the current situation people who probably could not normally have afforded to buy houses were enabled to do so. When the process of credit expansion ends much of the apparent additional wealth and capacity will turn out to have been a mistake and for a while there will be underemployment of people and capital, until such time as the structure of prices has readjusted itself. I know from past efforts to get this across that the only other person who cares is Robert Waldmann. I take some comfort in that. Elsa, I’m glad that you are enjoying my blog, but I don’t know how you concluded that I am not a fan of Hayek. I am a huge fan of Hayek. But being a huge fan of his doesn’t mean that I always agree with him. I see that you have learned your Hayek lessons well. I agree with Hayek that monetary policy cannot be used to increase employment lastingly beyond some equilibrium level of employment (though even this point is subject to some qualification because of the non-neutrality of money, but that is likely a second-order effect). However, there may be situations – and I think deep the Great Depression of the 1930s and the Little Depression of today are cases in point – in which monetary stimulus of some kind is necessary for a recovery. Hayek, to some extent, recognized his error late in his career, but I don’t think that his views were ever completely correct on this issue. I also agree that aggregates are tricky and must be used with care, but Hayek probably went too far in rejecting their use altogether. Implicitly Hayek recognized that there is an economic process that determines nominal income. He didn’t grasp that the process that determines nominal income can sometimes affect the nature of the equilibrium of the entire system. That brings us back to my point in the previous paragraph. I’m not so sure we have to have a great reason whenver we reject an idea. As you suggested with Kuhn-presuming his narrative-Galileo didn’t ave the best arguments on his side at first but still won. For me I also consider policy results-I know that may strike some as untoward in a scientific discussion. But the policy conclsiion of RBC is that we just have to wait for the market to sort it out. As I reject that policy conlusion I feel I have enough reason to reject RBC. Not that I find the hunt for better reasons to be off base. I look at it this way. If someone comes out with a rigorous, complex argument for why 2+2=5, maybe I can’t actually on the spot repudiate their argument, but I still am not convinced as I can repudiate their result. So I do think that’s sometimes appropriate. I will confess, that as an interested layman, it does seem like the pros are sometimes a little overimpressed by what they see as the right methodologies, and too little impressed by the actual results. It’s like a math teacher who gives you no points for your answer but only for your work. I can tell you, at least in the great Los Angeles area, we are not at full employment. Additionally, I do not believe that one in 20 American employees in 2008 suddenly decided they do not want to work anymore and so here we are today. Williamson is tying himself into knots, though to what end I cannot decipher. David, I think that there was some recognition by Hayek of the secondary effects of a downturn. But I have yet to see any recognition by the mainstream Keynesian side of the distortions to the structure of prices and production that an attempt to push up aggregate demand must cause. The best I have seen is work by Joan Robinson and John Eatwell which seems to me to accept the inconsistency between Keynes and standard neoclassical micro economics. If there is widespread unemployment how can we say that there is an equilibrium in the labor market? Their answer seems to be that the neoclassical economics is wrong and, building on Sraffa’s work, they tried to create a new micro economics with multiple equilibria in every market. This fits with Keynes in a way that standard economics does not. Personally I think they are wrong but at least they have the virtue of consistency. I understand your point Mike, about accepting the effects of policy, but I doubt we will ever agree on what these are. As can be seen from the early part of this article two people can look at the same numbers and decide that they support entirely different explanations. The testing by result idea is very attractive but I think fundamentally flawed. It seems to me like tossing a coin 100 times, it comes down heads 99 times and concluding that this demonstrates that standard probability theory is wrong, rather than concluding that the coin is biased. Keynes’s economics can be “proved” right in that if we push up total demand it is highly likely that for a period total employment will increase. But his theory is not consistent with standard micro economic theory and my view is that we need to look for consistency in the way that is required in math if we are to test economic theory. Testing by result, especially when we are looking at aggregates, is unlikely to be helpful and may be highly misleading. Will, Thanks for the history lesson. I admit that I care more about the history of economics than of physics, but there is surely a place for both — even on this blog. Mike, Galileo had great arguments, explaining how to reconcile Copernicism with our perceptions that we are stationary while the sun moves. He had amazing intuition and was able to defend that intuition brilliantly even though the empirical evidence to support his tuition was not yet conclusive. RBC is simply not credible theoretically, and the evidence that would support it is lacking. But it does provide smart young economists a lot of opportunity to publish papers once they have mastered the necessary tools. Unfortunately, publications are almost the only thing that counts for advancement in academic discourse. Benjamin, No one but committed RBC theorists believes that we are anywhere near full employment. But as Kuhn pointed out, a theorist will almost always be able to tell a story that rationalizes almost any observation within his theoretical framework. Mike, If you believe that the economy is always in equilibrium that is the only way to think about people who are not working. Elsa, Yes, indeed, there was, though it was unfortunately lacking during the Great Depression when his policy advice was tragically wrong. Whether increasing aggregate demand causes distortions in the structure of prices and production depends on the circumstances in which you are increasing aggregate demand. When labor and other resources are idle, those distortions, if they exist at all, are minor compared to the gains to everyone of increasing output and employment. The Keynesian mistake was to believe that there was a permanent trade-off between inflation and unemployment that could be permanently exploited. My own view is that we have to be open to the possibility that even approaches that we don’t agree with can have something valuable to contribute to our understanding. Hayek’s student Ludwig Lachmann was actually a big fan of Joan Robinson’s work and wrote perceptively and sympathetically about her work even though he disagreed with many of her conclusions. David, in part it depends on what you mean by his advice. I am not so familiar about what he had to say about the US but I think that he would probably have agreed with Keynes about the UK’s return to the gold standard in 1925, which meant that pretty much every price in the UK needed to fall if competitiveness were to be restored. Also I think there is nothing like enough emphasis placed today by most commentators on Milton Friedman’s work which seems to have shown that the Fed. just let banks go to the wall in the 1930s. They failed in their lender of the last resort role in a way that I doubt Hayek would have found good had he known what was actually being done at the time. Here I think there is some real relevance for today. The macroeconomic people seem to think that the stock of money can be adjusted almost at will by QE or other means. This is an area where Hayek parted company with Friedman, feeling that his rule for monetary growth would not be possible in practice. I doubt QE would have had a huge effect in the 1930s. What was needed was to keep the banks solvent which in itself would have held the money supply up. Turning to the next part of your comment I think this is a definite point where Hayek and the Keynesians would part company. You say that when labor and other resources are idle the Keynsian prescription might be better than the alternative. But what Keynes’s General Theory seems to assume is something rather more than this. It assumes what Hayek termed “full unemployment” so that when total demand rises no individual price changes relative to another. All that happens is that magically more resources of every kind are brought into use, an unlikely state of affairs. Keynes seems to have been particularly keen on playing with the long term money rate of interest to raise total demand. But this is almost bound to distort the economy, favouring as it does capital intensive businesses while at the same time discouraging saving and encouraging consumption. Personally I think this provides a good explanation of the reasons for the situation in which we find ourselves with eg the US housing market vastly overextended in 2007 while other areas of the economy were probably not experiencing anything like the same boom and with people in the US continuing to receive the wrong price signals from their government in that the taxes raised cannot possibly meet the money spent by the federal government. I would not want to suggest for a moment that the US should try to balance its federal budget overnight but it seems to me highly desirable that a long term plausible budget plan is put in place as soon as possible so that everyone in the US can plan their individual futures with a much greater degree of certainty and knowledge than currently exists about how much they will have to pay in tax in the future. Elsa, Despite what many observers contend there was little if any connection between Britain’s difficulties after restoring the prewar parity of sterling to the dollar and the Great Depression. That Hayek agreed with Keynes in opposing reestablishment of the prewar parity is thus, in my view, irrelevant to his policy stance on the Great Depression which was deflationary and simply wrong. Friedman’s contribution while valid in highlighting how utterly misguided the Fed was in allowing bank failures to spin out of control and exacerbate the deflationary tendencies already at work, did not explain at all what the causes of those tendencies were. And Hayek clearly misunderstood those underlying causes as I explained in my post last December on Hayek’s 1932 defense of the insane Bank of France. Banks became insolvent because of deflation and deflation was the result of the policies deliberately chosen by the insane Bank of France and the Federal Reserve. Stepping in to stop bank runs would have mitigated, but not eliminated, the underlying problem. The housing bubble that you sight was not created in an environment of widespread unemployment and idle resources, so the application of Keynesian policies was not necessarily appropriate in those circumstances. My own view is that the real resource misallocations associated with the housing bubble were not nearly big enough to account for the subsequent downturn and non-recovery. David, I had not meant to imply that the UK’s return to the gold standard led to the depression in the 1930s. My point was to show that Hayek was not always in favor of “hair shirt” economics. Secondly I doubt that he would have supported the “hair shirt” approach to the banks by the Fed. in the 1930s had it been clear at the time that this was what was going on. I would have to part company with you in thinking that the causation was all one way, that is from deflation to bank failure. I would be inclined to think that much of the causation was the other way round, that is it was the bank failures that led to the contraction of the money stock. To me one of the major points of Hayek’s work on the trade cycle is that the problems arise from a mistake in the structure of prices and production, not a problem with total demand. It seems to me that by 2007 housing markets in the US and many other countries had become overpriced as a result of easy credit and artificially low interest rates. The inevitable correction of this mispricing led to a banking crisis and has caught the whole world economy in the process. At any time we need prices to give the “right” signals. In Europe, probably the US too, populations are aging and it is going to get progressively more difficult for governments to pay for the health, retirement and other benefits that they have promised. Either people will need to pay more in taxes or the government must pay out less. The sooner the signals are corrected for this the better, so that everyone’s preferences can be co-ordinated and we do not embark on a fresh round of misallocations. This problem is mostly being avoided by governments for very obvious reasons. Second the pre 2007 boom distorted the economy which means that some factors of production are going to be unemployed for a while and there is not a great deal that can be done about it. I have read of some real estate prices falling by 30 – 40% in parts of the US which gives some indication of the extent of the distortions. My guess is that today in the US there is lots of movement in the labor market. The apparent overall stagnation masks a high number of people leaving jobs and a higher number of people taking new jobs. In the UK, which I consider a less dynamic economy than the US, overall employment is up by 600,000 in the private sector and down by 300,000 in the public sector, a net increase of 300,000. So I don’t see the situation as like the early 1930s when I suspect there was little take on of employees and huge numbers being laid off. It is going to uncomfortable for a while yet but any big boost to demand risks putting us back to the place we are in the process of escaping from rather than solving the problem. Elsa, Hayek acknowledged the importance of Friedman’s work on the Great Depression, no doubt about it. My own view is that Friedman greatly overstated the role of bank failures which were not the source of the problem, which was a deflationary increase in the monetary demand for gold. That was an international phenomenon as was the Great Depression, and Friedman’s discussion of bank failures in the US sheds no light on the international character of the contraction and makes the factually questionable assumption that the 1929-30 contraction was not out of the ordinary by historical standards. You are confusing two separate questions when you refer to Hayek’s disagreement with Friedman’s 3-percent rule. You can believe as I do that monetary policy is entirely under the control of the monetary authority while also believing that the Fed cannot make the quantity of money grow at a 3% rate every year and that the attempt to make it grow at a 3% rate can itself lead to a financial meltdown. If you would like more elaboration on these points I suggest that you have a look at some of my previous posts on the Great Depression and Hawtrey and Cassel or my paper with Ron Batchelder on Hawtrey and Cassel. You warn about distortions in the structure of prices and production associated with increasing aggregate demand. My short answer to that is that it is difficult to imagine that the distortions associated with reducing massive unemployment are anywhere near as great as the distortion inherent on that level of unemployment. That just does not seem even remotely plausible to me. I would have to disagree with economists who believe that we have reached maximum employment. There is no way that 8 % is supposed to be the new normal. I just don’t want to believe that. Personally, 8% unemployment is unacceptable. This simply can’t be the new normal. Tas, We are in total agreement on that point.